Khasias belong to Austro-Asiatic racial stock and their language could be grouped under Mon-Kher groups of language. They are famous for their matrilineal society. Socially Khasias are Meghalayan tribe. In Tripura they are only 366 persons as per 2011 Census. They live mainly at Kailashahar and Dharmanagar. In true sense, Khasis have no ethnic relation with other Tripura tribes. They are staying here from 18th Century for economic reason. 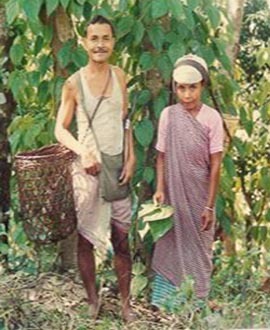 The Khasis in Tripura have their own garden of Betal leaf, which is popularly known as "Khasia Pan". Other than this plantation work they used to rear large number of cattle. By religion, Khasis were Hindus but from last part of 18th Century most of them embarrassed Christianity and follow the religious activities beside their amnesic rites and rituals. Their cultural life also has an important component of Indian Culture.